November | 2010 | Ooh, my favorite! 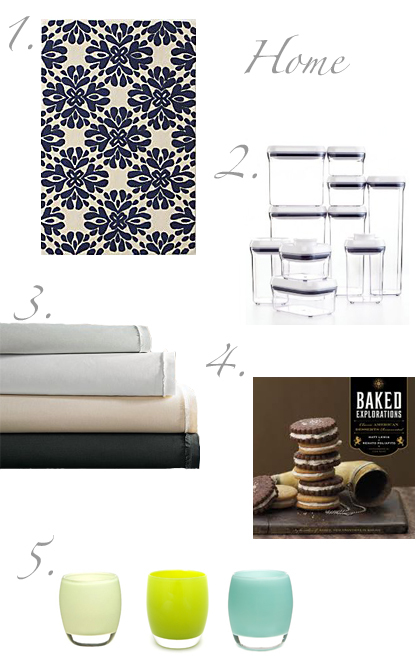 Here’s the first-ever Holiday Gift Guide – ooh, my favorite style! I’ve collected some of my favorite things from around the Web to share with you as inspirations and thought-starters to help you get ready for the holidays. Have fun, and get to shopping! Dotz identifiers Another great way to organize your cords. 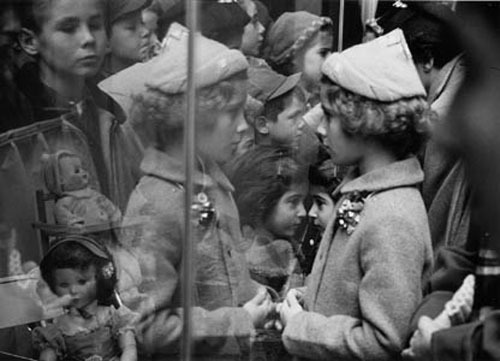 Anyone else have that scene in A Christmas Story floating through their mind? This is my absolute-favorite holiday; the pinnacle of my holiday hierarchy! Not just for the food, but because it’s also a cozy, lazy, jammies-only day. (Christmas is a close second for all these reasons.) And just as I’m recovering from an early Thanksgiving last weekend with my family I’m gearing up for round two back at home. 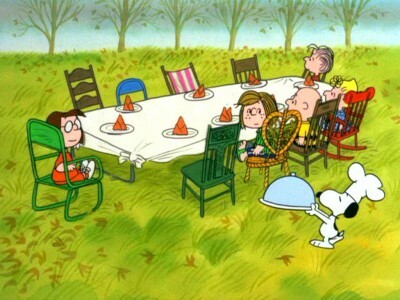 As much as I love this time of year I’m thinking that two Thanksgiving’s is a bit excessive. I’m feeling kind of guilty, so I should probably add some extra shifts at the SF Food Bank over the next few weeks. I hope you all have a wonderful holiday filled with good food and family. See you all next week! I’m in Seattle for an early Thanksgiving with my family. Oh but don’t worry, I have another Thanksgiving planned with my Lova next week too. Detox is finally over and I’m coming back with a bang! We just finished a beautiful dinner at Joule in Wallingford and now I’m sitting downstairs in front of the fire with dad playing Zelda on the Nintendo Wii and mom reading her Kindle. This is what I miss most about being home; this used to be my every Sunday. I can’t wait to get in the kitchen tomorrow for Christmas music and food prep for Sunday. What are you up to this weekend? Hope you’ve got some early holiday plans too. Stretch it out as long as possible is what I say! [image via Monroe Gallery] Isn’t it wonderful? I realize that I often post beautiful shoes and gush endlessly about how I lust and even dream about them, so what I’m about to say may not carry any weight, but I’ll try anyway: these ARE the MOST GORGEOUS shoes I have EVER seen. And truly and honestly, I have never wanted a pair of shoes more. 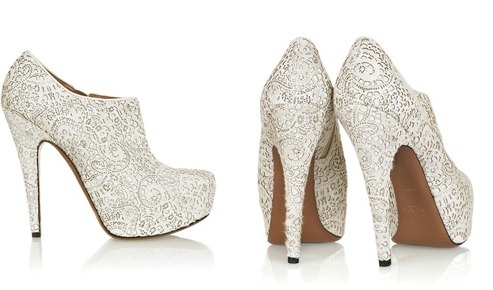 So delicate with the intricate cut-outs but also kind of rugged with the platform and bootie shape. Do you notice that under the cut-outs it’s calf hair? Very intersting! 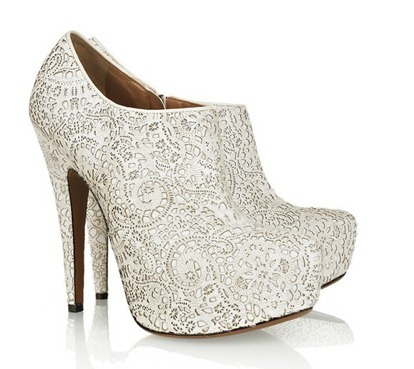 Check them out at Net-a-Porter ($2,375) and see how they look paired with a white dress! Looking at my collection of spices this past weekend I realized it’s pretty un-pretty: a hodge-podge of various jars and packages thrown into a tray, with a fair amount missing labels (which ultimately results in a fun but dangerous guessing game using the ol’ sniffer). 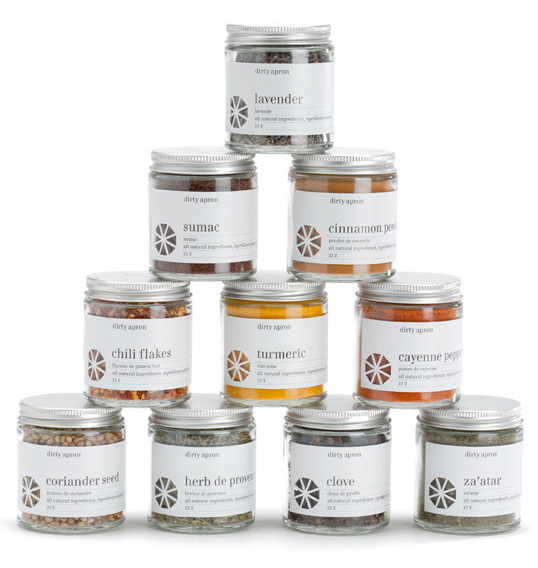 Wouldn’t it be lovely to have a pantry filled with these lovelies from Dirty Apron Foods? I often wonder why people like Thai food so much. The most accessible versions are often too sweet, overly-reliant on coconut milk, and just plain Americanized. I say this only because it is SO easy to happen upon mediocre restaurants; just take your pick from any one of the handful of restaurants that are probably within a mile of your house. 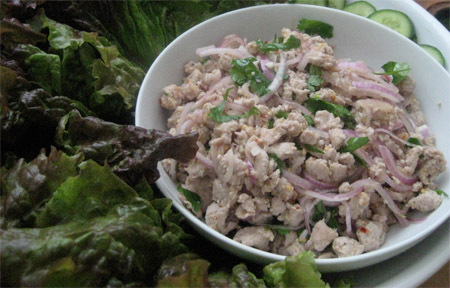 While Thai food is most certainly not the only type of ethnic cuisine to fall victim to oversaturation and Americanization, it is the cuisine that I hold most dear to my heart, so I can’t help but take half-assed recipes personally. 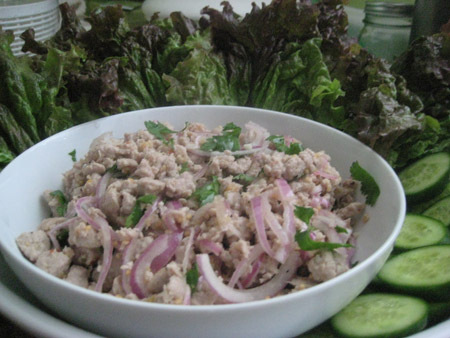 This, my dear friends, is why I am sharing my family’s Larb recipe with you: complete with a secret ingredient! I truly hope you love it as much as I do. Rice. 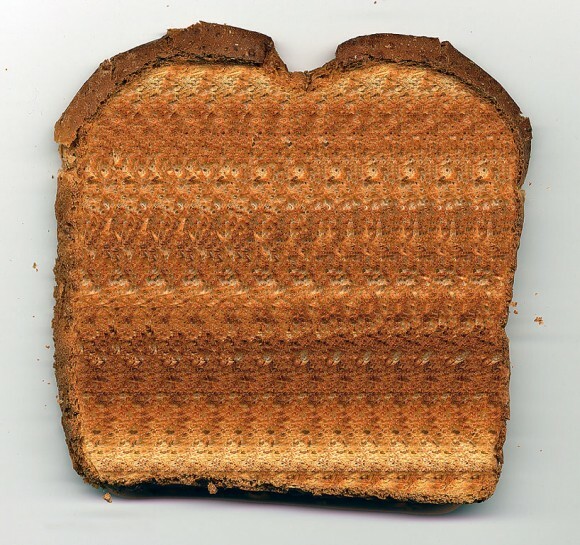 Toasted. Yep, that’s the key. If you’ve never experienced this flavor profile before it truly should not be missed. Similar to sesame oil, it’s all about the fragrance: slightly nutty and even a little smokey it’s unlike anything else. 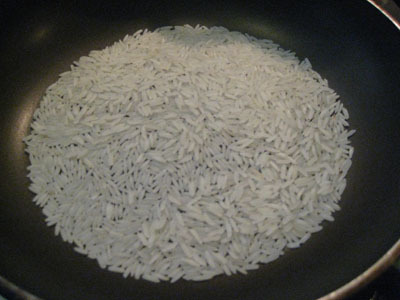 In a skillet over medium heat, add a single layer of jasmin rice (uncooked). Swirl the pan regularly to avoid burning and adjust the heat as needed. 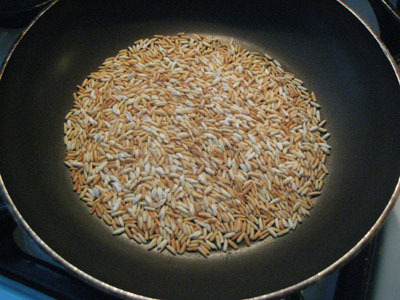 If the grains are popping lower the heat, but if they are not browning after a few minutes raise slightly. After about 10 minutes the grains should no longer be translucent but milky white and mostly browned. Remove from head and add directly into a blender. 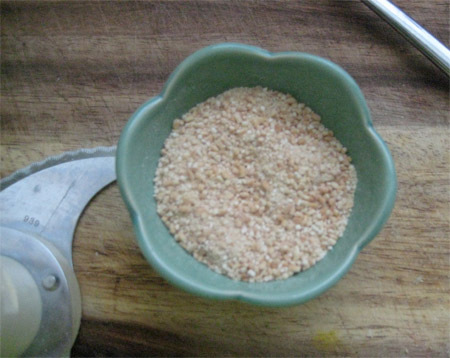 Pulse the rice into a coarse powder. The texture will be inconsistent: very fine with some larger granules mixed in. Set aside. Finely mince the garlic and set aside. 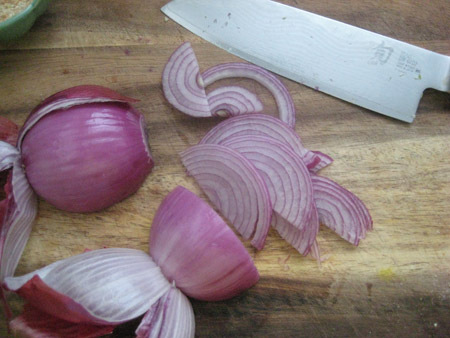 Then thinly slice one purple onion and set aside. In a large skillet over medium heat, add the olive oil. Once up to temperature add the minced garlic and saute until fragrant but do not brown (about 1 minute). Add the ground chicken and begin to brown. Add half of the fish sauce (1-2 teaspoons) and a few grinds of black pepper. Mix well and break into small pieces. 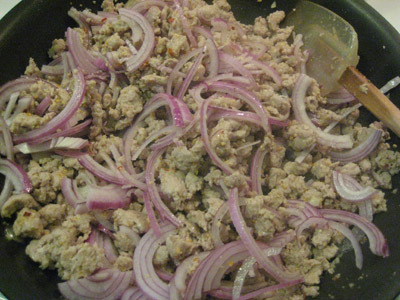 Note: Ground chicken and turkey tend to take a bit more work to break into smaller pieces. Continue to brown until slightly underdone, add lime juice, remaining teaspoon fish sauce, red chili flakes, and a small pinch of sugar. Mix together, then add the toasted rice powder. Continue to cook until the chicken is completely cooked through. Turn off heat and add the onions. 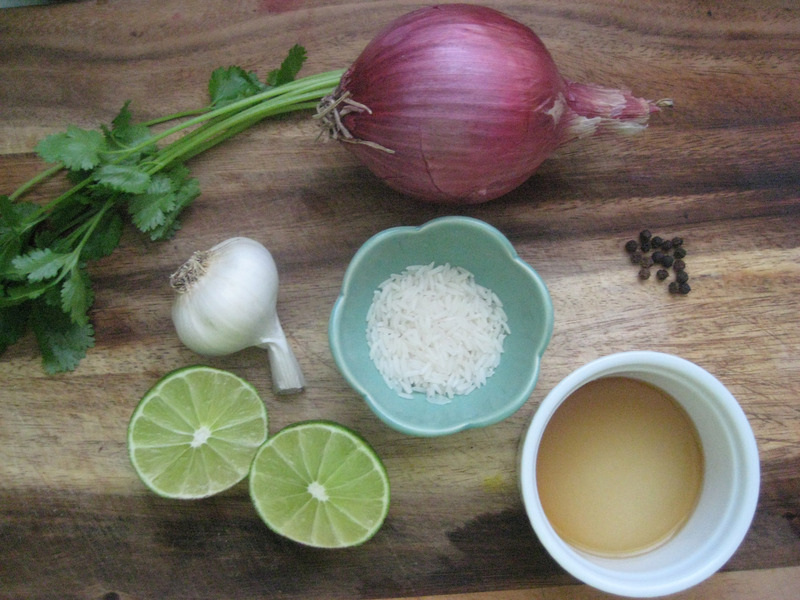 Taste for seasoning and add more fish sauce or lime juice as needed. Mix well and set aside. Just before serving add the chopped cilantro and mix well. 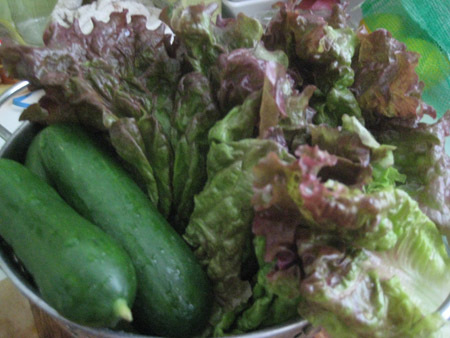 Serve with crisp whole red lettuce leaves and thick slices of english cucumber. Tip: Since I was bringing this as a potluck dish I didn’t add as much of the red chili flakes as usual. If you’re worried about your guests tolerance for heat, you can always add less and have a small dish on the side for each person to add extra. One of my all-time favorite dishes I really want you to have the chance to taste it as it’s truly intended. It’s a super simple dish that will have you second guessing that last minute take-out. 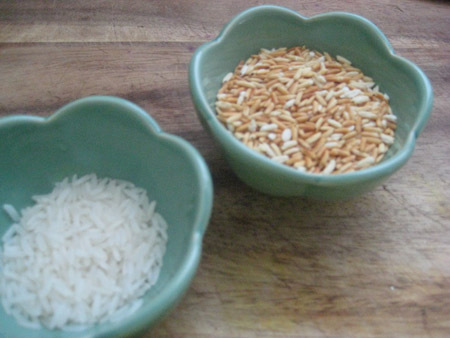 If for nothing else, you must try this to check out the toasted rice; it’s a flavor and scent that’s unlike anything else. Please let me know what you think!